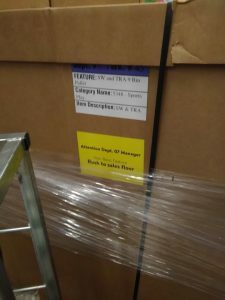 While Brickseek isn’t always reliable when it comes to inventory quantities, it’s usually pretty good in letting you know the price of an item in store (if it’s there at all…). 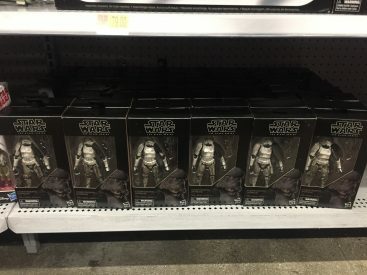 It looks like Walmart has begun marking down Vintage Collection figures. Most stores in my area are $9.87. Let us know if you find figures at a lower price point in the comments! 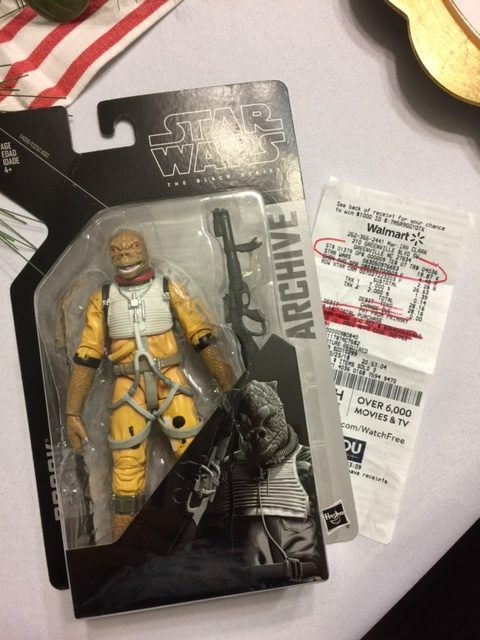 46 figures… and at least 10 are Snoke. Any bets on how long it will take to clear the pegs? 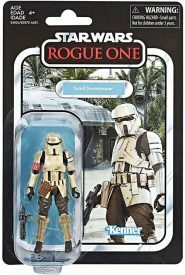 ← Don't Forget To Check The Clearance Aisles For New Resistance Figures! 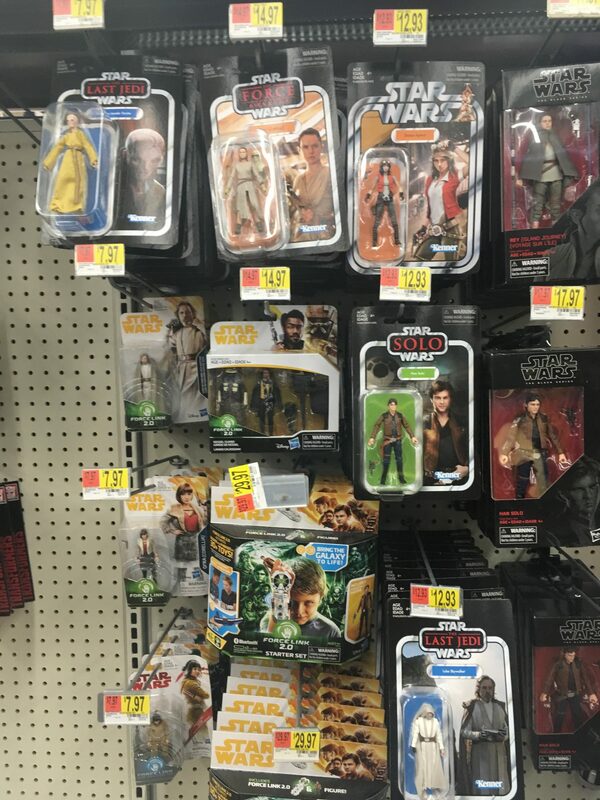 Walmart: Hasbro's "GREAT" Retail Partner! Pop Quiz! The image below represents what approximate date? A. October 2018. B. November 2018. C. December 2018. D. It doesn’t matter. This is how the section always looks and I can’t remember the last time I could purchase something from it that remotely interested me. 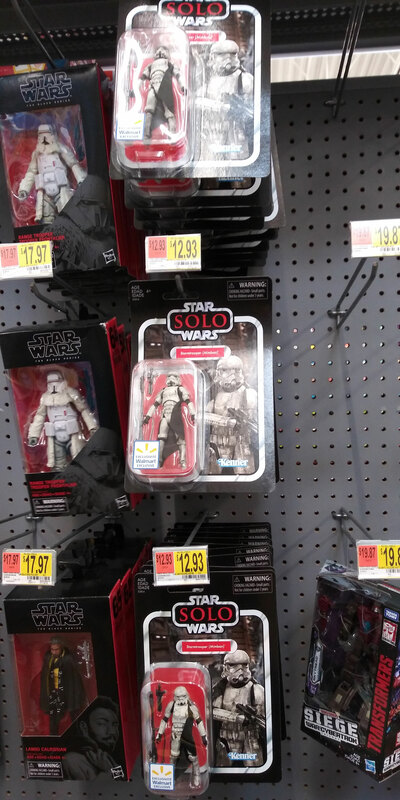 SPOILER: The answer is D. In all honesty, save for some unwanted TVC products like the Imperial TIE Fighter and the repacks, I don’t think this section has changed since the Solo: A Star Wars Story product launch. I really enjoy your website. 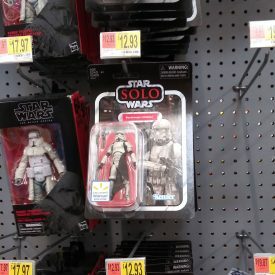 Tonight I was wrapping up some last minute shopping hoping to find the new Resistance figures or maybe even the latest Solo wave and came across this. 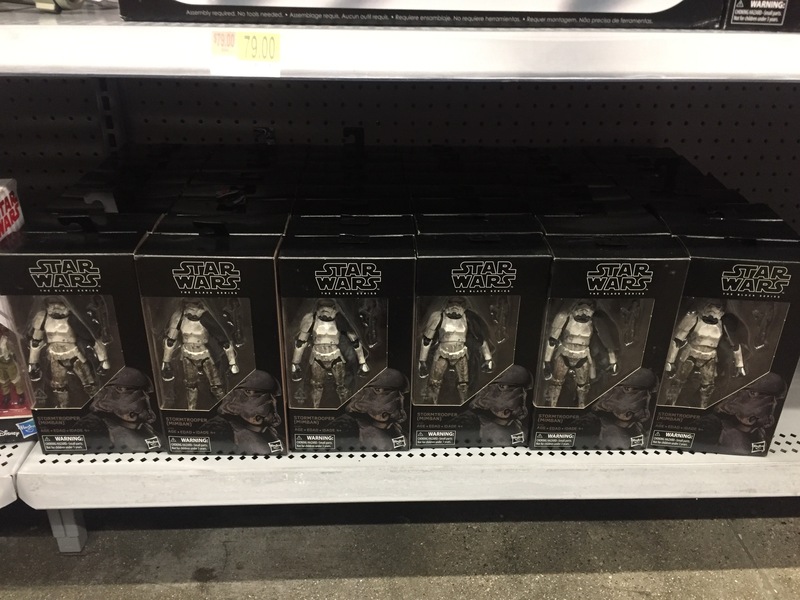 The whole new archive black series wave was at my local Walmart in Greenville NC. 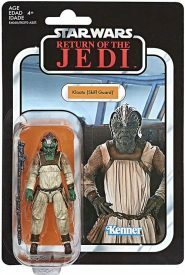 Luke, Boba, IG-88, and this guy, who had to come home with me. They are out there! Despite the gloom of boxes worth of wave 1 hitting Walmart in droves this month, All is not lost, guys! I just dropped into the Wadsworth, Oh Walmart Supercenter and found, to my amazement, a treasure trove of Waves 2 and 3. 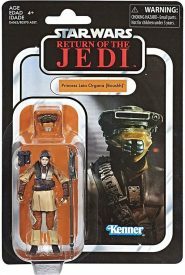 I counted 3 Dr. Aphras and 2 Hovertank pilots, and plenty of Young Han and Range Troopers! Granted, the stock workers got lazy and hid the bulk of the new figures on the shelf above the pegs, but I did my duty and pulled them all down, then squeezed them onto the pegs to be found better. 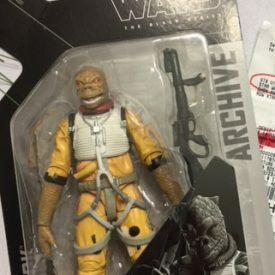 I’m personally set with TVC so far, so I didn’t grab any (tho I did pick up a Black Series Bespin Han that’s been there for a week), but hopefully this means others will be able to plug holes for a decent retail price. Happy holiday hunting, guys! 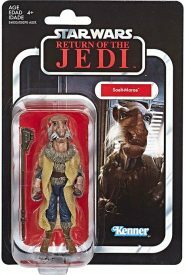 There hope yet for Star Wars collector’s this Christmas! ← Showrunner For Upcoming Diego Luna Star Wars Series Found! I went to Walmart late at night for some groceries, and of course meandered (first thing) over to the toy section. Christmastime is always fun because there are a good 5-10 pallets of new inventory waiting to be stocked. After searching through the pallets to see what there was, I found several boxes of goodies… and baddies! Click through to find out more. 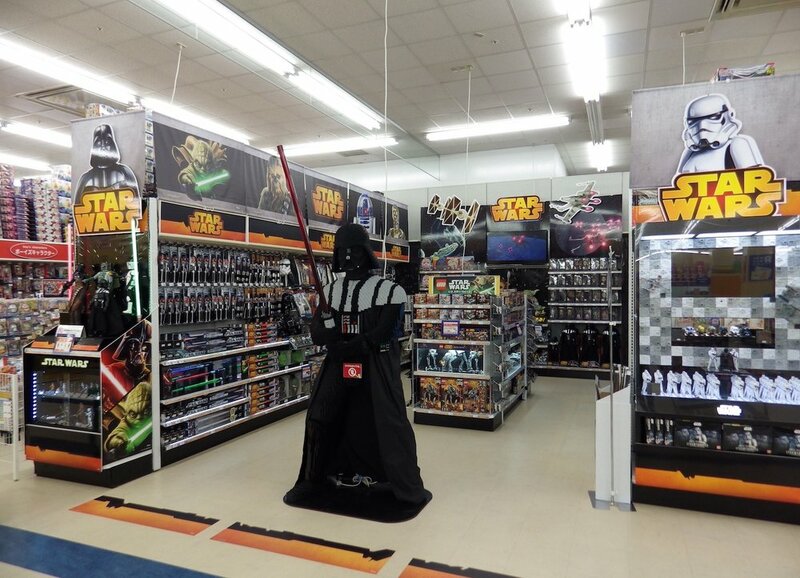 Walmart had dropped hints months earlier that they would try to fill the retail toy footprint abandoned by Toys R Us’ demise. But now Walmart appears to be a little too cocky for their own good. Billing themselves as “America’s Best Toy Shop,” it looks like they have bigger plans they can handle in mind. Or maybe it’s all a facade. Only time will tell. Click the image below to see their latest ad. Special thanks to JTA reader RB for sending it our way.